Dark photon hunters at RHIC’s PHENIX detector: Stony Brook University postdocs Deepali Sharma and Yorito Yamaguchi with Brookhaven physicist/PHENIX co-spokesperson David Morrison and PHENIX collaborator Yasuyuki Akiba, vice chief scientist at the RIKEN Nishina Center in Japan and experimental group leader of the RIKEN BNL Research Center at Brookhaven Lab. Scientists searching for signs of elusive “dark photons” as an explanation for an anomaly in a groundbreaking physics experiment have nearly ruled out their role. Though the postulated particles could still exist as carriers of a force affecting dark matter, it is increasingly unlikely these particles from the “dark sector” can explain the discrepancy scientists have seen between a precision measurement of the behavior of muons (cousins of more familiar electrons) and calculations based on the reigning theory of particle interactions. “We were hunting for a ‘bump’ in a very narrow range of data that could indicate dark photons interacting with muons—but we do not see a signal of this dark photon,” said Yasuyuki Akiba, one of the physicists involved in the search. The results, accepted for publication as a rapid communication in Physical Review C, leave open the possibility that something even more unusual might explain the anomalous experimental results, the only known deviation from a prediction of the long-standing, thoroughly tested Standard Model. Alternatively, they could indicate a problem with the muon experiment—an idea that scientists will soon get a chance to test—or that dark photons have properties not detectable by the current experiment. The former experiment, known as the muon g-2 experiment, made precision measurements of how the spins of these subatomic particles “wobble” like tiny tops as they circulate within a powerful magnetic field. The results (announced in 2001, 2002, and 2004) deviated significantly from theoretical predictions, indicating there might be some kind of particle beyond those described by the existing Standard Model that were exerting some force on the muons. The second experiment, the PHENIX experiment at the Relativistic Heavy Ion Collider (RHIC), a particle collider operating as a DOE Office of Science user facility at Brookhaven Lab since 2000, picks up signals of particles as they emerge from energetic particle collisions aimed at exploring the fundamental building blocks of matter. As the search for explanations of the g-2 results heated up, physicists at PHENIX realized they had an untapped dataset that might offer insight into one possible source, dark photons. 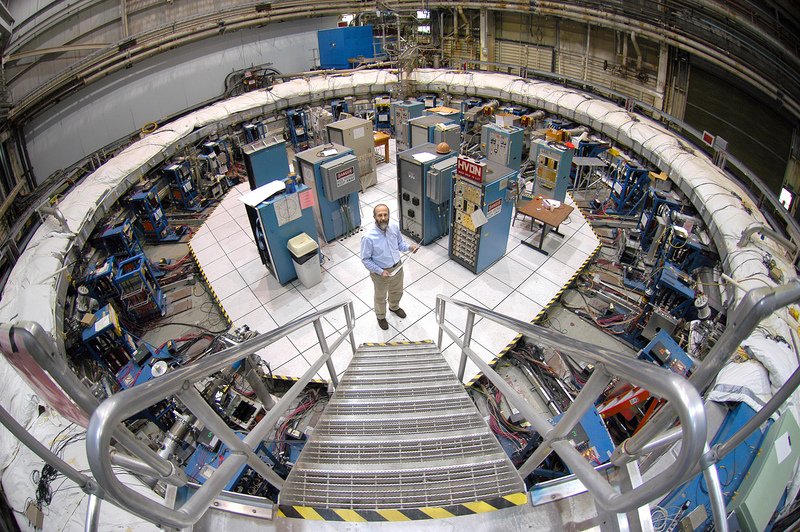 The “g-2” experiment at Brookhaven Lab discovered an anomaly in the way subatomic particles called muons wobble in a magnetic field. Scientists have been searching for explanations for this anomaly, including a possible role for dark photons. The g-2 muon storage ring later traveled from Brookhaven to Fermilab, where a followup experiment will refine the g-2 measurements. One person who’s been working on this search is PHENIX collaborator Yorito Yamaguchi, who started the analysis as a postdoctoral fellow at the Center for Nuclear Study at the University of Tokyo, and continued in his current position as a postdoc working with longtime PHENIX collaborator Abhay Deshpande in the RHIC Spin Physics Group at Stony Brook University (SBU). “We know that dark matter is filling our universe,” Yamaguchi said, referring to the mysterious invisible substance that together with dark energy comprises some 95 percent of the cosmos. According to physicists, there must be force carrier particles that mediate the interactions of dark matter particles, analogous to the photons and other force carriers that mediate interactions among the particles of the Standard Model. The lightest of these “dark side” force carrier particles is called the dark photon. “If dark photons exist, they can mix in with ordinary photons, essentially switching back and forth with ordinary photons, and make a contribution to other particles’ interactions,” Yamaguchi explained—including the degree of wobble of the subatomic muon in a magnetic field. PHENIX collaborator Yasuyuki Akiba, vice chief scientist at the RIKEN Nishina Center in Japan and experimental group leader of the RIKEN BNL Research Center at Brookhaven, likens the unseen effect to the way the outermost planets in our solar system affect the movement of the other planets through the force of gravity. To figure out where to look for dark photons that might explain the g-2 anomaly, the PHENIX scientists turned to theorists’ calculations on the effects such unseen particles might have on the value of g-2, one of the factors in the equation describing the magnetic wobble of the muon. “The dark photon can add to the muon g-2 prediction, but the amount depends on its mass and how it mixes with ordinary photons,” Akiba said. There is a range of possible dark photon masses and mixing parameters the physicists can explore to see if there are signs of such interactions, and experiments around the world have been searching—so far with negative results that have gradually ruled out the places such dark photons could be hiding. “So we are like astronomers looking in the remaining region that could possibly explain the muon g-2 experiment results,” Akiba said. What the PHENIX physicists were actually looking for was a bump in the production of pairs of electrons and their positively charged counterparts, known as positrons. Such electron-positron pairs are produced very occasionally from photons emerging from pion decays in RHIC collisions. “It’s a small effect, but easy to see,” said Brookhaven theoretical physicist William Marciano. Those regular, or background, pairs are produced with a well-known, smooth distribution, he said. But if one of the photons mixes with a dark photon, which then decays to an electron-positron pair, the distribution is not smooth. Instead it occurs at the specific mass of the dark photon—the peak the scientists were searching for—rather than a continuum of values. Putting all the data together, they did not see a bump. Coincidentally, another experiment searching for evidence of dark photons that could explain g-2, the BaBar experiment at DOE’s SLAC National Accelerator Laboratory, recently published a very similar result. “They covered a very wide region, including the one we studied, and they don’t have any signal that explains g-2 either,” Yamaguchi said, adding that the two independent experiments make the result ruling out dark photons even more concrete. 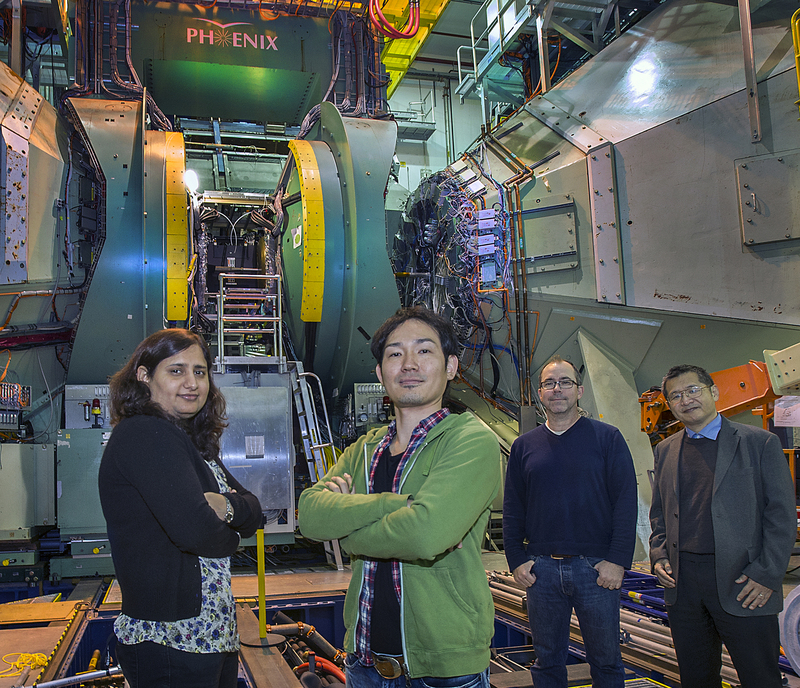 With 100 times more pion decay data already in hand from the 2014 RHIC run, the PHENIX team hopes to further increase the certainty of their result. What about other explanations for g-2? Physicists have long-suggested the existence of so-called supersymmetric partners of the existing Standard Model particles that might trigger as-yet-undescribed particle interactions. Experiments at the Large Hadron Collider have been searching for signs of these predicted supersymmetric particles, but so far no such signals have turned up. “They’ve eliminated large chunks of parameter space, but they can’t say the idea of supersymmetry has been eliminated completely,” Marciano said. Could there have been a problem with the muon g-2 experiment? 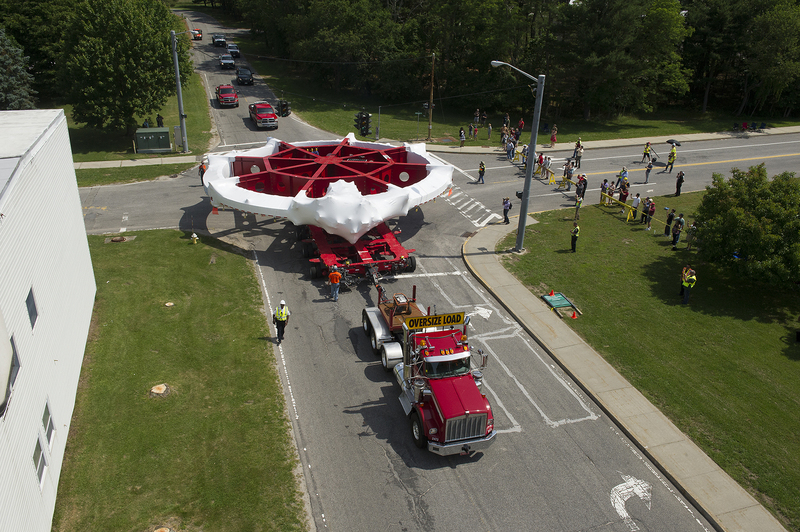 Physicists will soon get a chance to repeat the measurements thanks to a monumental undertaking to transport the muon g-2 storage ring from Brookhaven to DOE’s Fermi National Accelerator Laboratory in 2013. At Fermilab, scientists are reconstructing the experiment to make use of a much more intense and pure beam of muons than was available at Brookhaven. With a four-fold increase in the measurement’s precision, the new experiment, set to start in 2016, will be more sensitive to virtual or hidden particles and forces than any previous experiment of its kind. The results will reveal whether the anomaly still stands, and, if so, set off a new quest for explanations. Ten years after it ceased taking data at Brookhaven, the muon g-2 storage ring embarked on a cross-country journey from the woods of Long Island to the plains near Chicago. And what about the existence of dark photons? Theoretical physicists say there are still good reasons these mysterious particles should exist—to explain a variety of unrelated astrophysical observations. “Dark photons that could explain some of these phenomena, such as a possible excess of positrons coming from outer space, don’t need the same properties as you need to explain the g-2 anomaly,” Marciano said. But there are other possible explanations for these phenomena as well, he said, so the search for signs of darkness in the astrophysical arena may not be as clear-cut as it was for g-2. What is clear is that the quest for understanding the subatomic particle soup that makes up the cosmos is far from over. But the process of science—which includes the interplay of theory and experiments that put predictions to the test, repetition, increasing precision, and being alert to unforeseen connections—will continue to bring the subatomic world into ever-sharper focus. The muon g-2 experiment at Brookhaven was funded by the DOE Office of Science, the U.S. National Science Foundation, the German Bundesminister fur Bildung und Forschung, and the Russian Ministry of Science, and through the U.S.-Japan Agreement in High Energy Physics. Research at RHIC is funded primarily by the DOE Office of Science and also by these agencies and organizations.